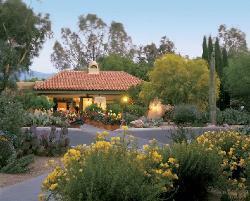 Canyon Ranch is situated on more than 150 acres in the Sonoran Desert in Tucson, Arizona. Canyon Ranch was once the center of a sizable cattle ranch. From the 1930s into the 1970s is was a guest ranch. Start you Search For a Tucson Home – Here! Canyon Ranch takes advantage of Tucson’s sun-drenched climate. Clear desert air make the views of the Santa Catalina Mountains unforgettable. This setting and the incredible facilities make Canyon Ranch a classic spa vacation destination. Hiking, biking, outdoor dining and lounging by the pool are available the year-round. Take a stroll around the stunning grounds or just sit a a quite area. Quail will be seen in many places. Roadrunners and other wild life are also making a visit in this natural environment. You will be fascinated by the cultural and historic richness with this much filmed and photographed part of the world, and the lofty cactus and vast desert skies cannot fail to stimulate you. When you arrive to Canyon Ranch, you’ll enter the comfortable Clubhouse. The Clubhouse is at the center of the resort. In the clubhouse you can rest beside the original stone fireplace of the old guest ranch. Read a book or get a healthy drink and delicious snack at the refreshment bar outside the Main Dining area. Enjoy a delicious mock cocktails before an evening meal in the Wicker Lounge and watch live entertainment in the evenings. Take time to read your email, browse the Library or view a movie in the Media facility. Find a book to read or play a board game and watch your other guests go by. Sit down by the Flagstone Pool with a glass of iced tea at the lovely Double U Café. Whether indoors or outside activities abound and are just a few yards from the Clubhouse. Interested in moving to Tucson or looking for homes for sale Tucson Arizona? We can help!